With the mid-summer break upon us after the Hungarian Grand Prix last weekend, it’s a good time to step back and reflect upon how the season has been going so far. There will be a series of these posts pitting team against team and driver against driver to see who has been the “best” so far in a range of categories. To start off, we’ll be taking a look at which team has been the most reliable this year. Car reliability is a phrase uttered at almost every Grand Prix, whether it’s a good thing or bad really depends on the situation. In our case, we’ll be taking a look at accidents (for the drivers) and technical failures (for the teams). Starting with accidents, we took a look at all crashes in a race situation, and it turns out only 11 drivers have accounted for the 18 accidents this year. The 2013 season saw 24 accidents, and we are on pace to break that number once the season resumes. These 11 drivers are exactly 50% of the field. Of those, Nico Hulkenberg is the only one to be in the top 10 positions of the standings (Hulkenberg is 7th). The driver with the most accidents? It’s actually a three way tie with 3 each between Sutil, Gutierrez and Massa. Those three drivers combined only have 40 points (all coming from Massa), 19.8% of championship leader Nico Rosberg’s points. 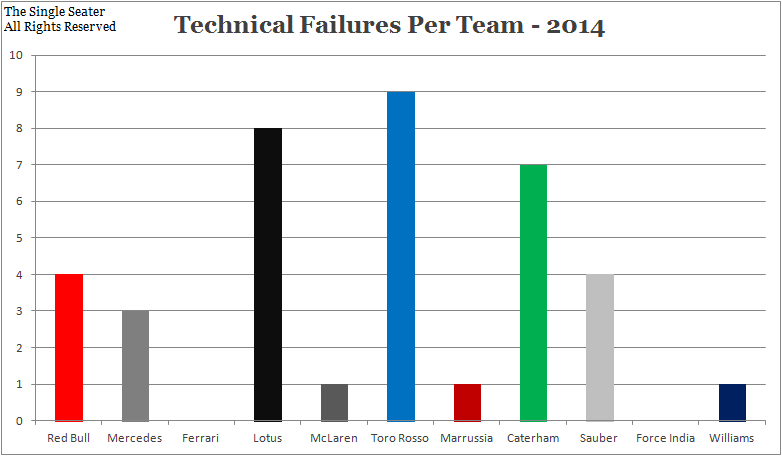 Taking a look at technical failures, we get a lot more drivers involved. 15 of the 22 drivers in the field have had at least one technical failure, some five times that many. Jean-Eric Vergne has had five failures, the most of any driver this season. His teammate, Daniil Kvyat has four, making Toro Rosso the worst performing team this year. Lotus is the runner up for the (least reliable) lead with eight so far, double what they had through the entire season last year. The teams with no technical failures this year are Ferrari and Force India, but that hasn’t been uncommon in the past. Ferrari in particular have had a long history of great reliability and consistency. But what’s the reason for the boost in the number of failures and accidents this year? It’s definitely not the age of the drivers, most of the drivers who competed last year are back again this year (and obviously a year older). The factor could be the change in technical regulations that teams were’t ready for with the limited number of testing days. We saw Red Bull struggle with the change of the car in the preseason and it has continued right up to the mid season point; they have four failures already contrary to three at the end of the season last year. So should the FIA give more testing days and advanced noticed in terms of technical changes, or are the failures attributed to something else? Let me know your thoughts in the comments below. Track notes for the Hungaroring circuit in Budapest, Hungary. The last two years Lewis Hamilton won this race in commanding fashion, he has also won it two other times, making him the most winning driver at this circuit in the current grid. Jenson Button is second on that list with wins in 2006 and 2011. Expect this year to be no different than the last two, Hamilton has been dominant at Hungary and amazing so far this season. The only driver more dominant than Hamilton at this track is the German driver Michael Schumacher. Nico Rosberg is the driver that should be worried about his championship position to his teammate. Over the course of the last three years, his average finishing position here has been 12.6. This includes a 19th place DNF and only one top 10 finish. Hamilton’s average is 2.0, a 10.6 spread and enough to swing the points standings into Hamilton’s favor. If Hamilton was to win, Rosberg would need to finish 4th or better to keep his lead in the points. If Hamilton does manage to get the lead, he certainly won’t be home free for the season. In the second half of the season (races after Germany) in 2013, Hamilton managed an average finish of 6.9. This is compared to his first half of the season results of 4.8. Rosberg is on the good side of this stat, improving to 6.7 in the second half from 8.3. Rosberg will be coming for Hamilton if he loses the lead going into the summer break. He should only get better when the season resumes in the fall. Over at Williams Racing, Valtteri Bottas is coming off a huge third place in Germany and will hope to continue that form going into the break. With that finish, Bottas helped Williams move into third in the constructors championship ahead of Ferrari. Last year, Bottas suffered an engine failure but his teammate, Pastor Maldonado, managed to put the car into 10th position. We expect Bottas to do that easily and have a good chance of cracking the top five again as well. A maximum of 250 points are available to any one driver throughout the duration of the remaining races. Look for the Mercedes duo, Ricciardo, Bottas and Alonso to all be in the hunt for podiums and points in the last ten races. Who do you think will take home the Hungarian Grand Prix win and lead going into the break? Let us know in the comments or on twitter. Is Williams Regaining Their Success? If Hamilton hadn’t finished where he did, things would have been a lot worse for the world champion. Even a 14 point deficit is going to to be hard for Hamilton to make up with the way Rosberg has been performing. Nico Rosberg has won four times this year, finished second five times and has only one DNF. Even if Hamilton was to win the next eight races, he could still lose the championship, (although highly unlikely) because of the addition of double points in the last race. Lewis Hamilton is going to have to secure some great finishes in the next races and hope Rosberg suffers a poor result to take back the championship lead. Speaking of Nico Rosberg, he is having the season of his career. His average finish is up 4.2 places since last year (to 3.2) and he is on pace to win the Driver’s World Championship if he continues his form and reliability through the second half of the season. The highest Nico has ever finished in the driver’s championship is 6th last year. With only one retirement this year to Hamilton’s two, the car performance has been fantastic for Rosberg. Another thing Rosberg has going for him is his second-half of the season results. In 2013, Rosberg’s average finish through the first 9 races (through Germany) was 8.3. For the last 10 races of the season it improved to 6.7. Nico has performed better in the second half of the season, so look for him to be on fire when Hamilton is coming after him. Third in the points standings is Red Bull rookie Daniel Ricciardo. He currently has 106 points and is 84 points out from Nico Rosberg. Ricciardo has been significantly better than his four time world champion teammate Sebastien Vettel. Ricciardo has 4 podiums so far this year and an average finish of 7.0. Compare this to Vettel’s 82 points, 2 podiums and 8.9 average finish, and it looks like Ricciardo should be the number one driver for the team. If things continue this way for Vettel this could be his worst performing season since 2008. The current points standings in the Driver’s Championship. The driver’s championship is down to the Mercedes duo of Lewis Hamilton and Nico Roseberg. The latter is coming off a win in Germany and a 14 point lead when Formula 1 goes to Hungary this week. Hamilton has won at this track four times, including the last two years. Even better for Hamilton is that his teammate has an average finish of 12.6 at this track over the course of the last three years, compared to his 2.0. Hungary is one of Hamilton’s best and Rosberg’s worse tracks to race at historically. Hungary could be just the place for Lewis Hamilton to take the fight back to Rosberg and put himself in the championship lead. Which driver do you think will win the Driver’s World Championship? Let me know in the comments below. This Sunday we saw rain-filled racing in Toronto, with the first “true” double header in IndyCar since June 28th, 1981. That race was won by Rick Mears at Atlanta Motor Speedway. Both Mike Conway and Sebastien Bourdais took home impressive wins in their races, but the races get even more impressive when we look at them by the numbers. 4:05 Drivers had just around four hours between races Sunday, about 1/6th of the time they were expecting to be able to recover for the second race in. If the race was a week away, (like the normal schedule), drivers would have had roughly 36 times more rest before they had to get back into the car. 15 The number of points Will Power gained on Helio Castroneves’ championship lead after Castroneves finished 12th in the second race in Toronto. The gap is down to just 13 points separating first and second place, with only four races left in the season. 266 Points are available over the course of the final four races. The 500 mile Fontana race receives double points (as did the two other 500 mile races this year). Strictly speaking, any driver in the top half of the points standings (roughly) could still win the championship. 20 Caution laps in race 2 of the double header. This was over the course of 7 cautions (the second most in a race at Toronto in the last five years), and the race worked out to be under yellow for 35.7% of the time. Race 2 had the 5th most caution laps of any race this season. Race 1 was under yellow for only 7.7% of the time. 73.168 Was the average speed (mph) of Race 2 in Toronto. This is attributed to a relatively large part of the race run under caution. This was the lowest average speed at this track during an IndyCar race over the last 5 years. 2443 Days before Sunday’s race was Sebastien Bourdais’ last racing win. The win came at Mexico City in late 2007. With this win, Bourdais climbed to 10th in the standings, 175 points behind Castroneves. The Toronto races brought some interesting numbers out to play and tightened up the championship race, with about half of the field gaining points on Helio Castroneves. Between the next three races and double points in Fontana, the championship standings are only going to get tighter.